Extension Installed on Current Browser. 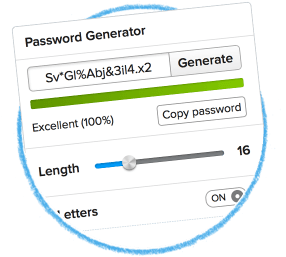 Store and manage all of your passwords in one secure vault. ...realizing that there's an extra hour in every day. Every feature you will ever need. Quick, slick and simple to use, Limitlesslane redefines what is possible on the web. Instant account access, no manual login needed. Secure use from any computer connected to the web. Login once and never have to manually login again. Unbreakable passwords we create and store for you. Enjoy the fastest browsing experience available to anyone. Individualize accounts with additional data options. Categorize your websites, customize your accounts. 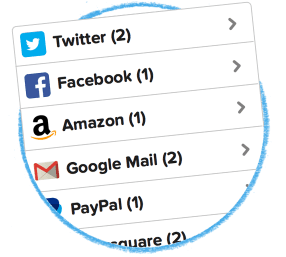 The quickest, simplest route to all of your accounts. ...this is only the beginning. More than just Bank-level security. When it comes to your online security, all you need to know is that your critical information is available to you and only you, no one else... not even us. Join Limitlesslane and always move forward. Become a member today, either for free (test mode) or for a small monthly sum (active mode), and enjoy our comprehensive range of services. Never pay a penny if you have 10 accounts or less. Initial activation fee of $15 - your first three months of service. Oh, and did we mention our generous referral progam? There's nothing as trustworthy as word of mouth. So, if you tell your friends and colleagues about us we'll spread the love around - $10 for you, $5 credit for the person you refer. Great beginnings come from simple ideas that are genius at the same time. Limitlesslane is part of my life now, I don't know how I could live without it. I recommend this web-app for people who forget their passwords and for people that are lazy to type the login information, this will do it for you and actually It even speeds up other websites and make sure it goes only through SSL. I haven't found anything wrong with it except that I need it to work on my phone as well. i love this website application, it makes life v easy, secure and fun to use. i recommend it to everyone, a must try. no more worries about saving passwords. This service saves me headaches from remembering all of my passwords! since i'm a gamer I use a lot of forums and other gaming community websites and it is really hard to keep track of all of them. My parents love it even more because with age their memory get worse and the other awesome thing is you can save those stupid security questions that you never remember. What is the most important thing I should know? You must never forget your master password. This is crucial. What happened if I lose my master password? Can't I just reset it? Unfortunately not. The reason Limitlesslane is so safe is because you’re the sole key-holder to your master password. We’ve got no record of it anywhere in our servers. So, if you do lose your master password but want to maintain a Limitlesslane account, you’ll have to start over again by reseting your entire account. It’s tough, we know – but this is the only way to keep your information stored safely. What exactly is resetting my entire account? Resetting your account is resetting a new master password with your old same settings. The only thing you won't be able to recover is your data added in manage section (passwords, account information). What are the basic requirements to use Limitlesslane? All you need is a valid email address and a browser that is compatible with our browser extension (We highly recommend Google Chrome, especially for speed and security). Et Voila! Why should I install the browser extension? Because it is the essential ingredient of Limitlesslane. It provides automatic login, automatic save of your accounts as well as generating ubreakable passwords. Can I still use Limitlesslane without extension? 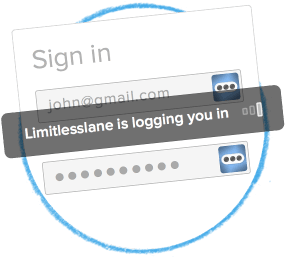 Without the browser extension, Limitlesslane will only work as a storage warehouse for your passwords and account information. Click on-login-enjoy... All within the blink of an eye!